In last week’s episode, co-host Michael Schein discussed his unique approach to selling, and today we have the man who gave him the know-how. According to Sales Evolution CEO Scott Messer, the best salespeople have what he calls “guess free conversations.” Over the course of this conversation, Scott challenges the hosts and audience to face their fears, forget about antiquated techniques and formulas, and focus their efforts on making a true emotional connection. The most irresistible question in sales. Why the most challenging sales relationship is the one you have with yourself. A fresh approach to referrals (and how to use it). The surprising importance of transparency. 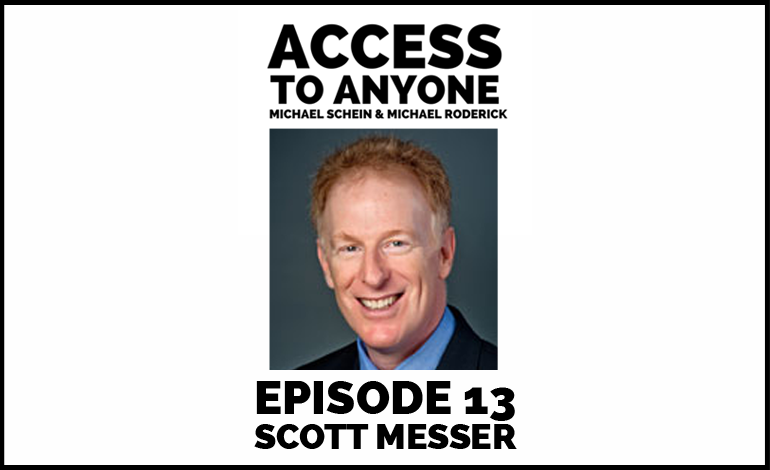 Scott Messer’s career as a business development professional and serial entrepreneur spans over 25 years. Scott brings to Sales Evolution a blend of leadership, management and communications skills, and a diverse background of experience in firms ranging from large, established companies to early stage ventures. He has built strategic alliances, co-founded start-ups, overseen two mergers and acquisitions, and built new business units. Before starting Sales Evolution, LLC, Scott held sales management and executive positions at Union Carbide, American Chemsol Corporation, Griff Machine Products Company, Ultimate Software Group, Data Flow Information Systems, Compuware Corporation and Growth Dynamics. Scott helped these firms launch new products and services, establish sales territories, and raise capital.